The word ‘Disneyfication’ is usually pejorative, implying noise, trashiness and escapist superficiality. Not any more. It was only a matter of time before ‘difficult’ history and learning were sweetened to something more palatable and instantly gratifying. Serious cultural commentators are now using this word to describe a useful policy designed to increase the appeal of museums and historical sites. Boring ruins, they say, should be reconstructed into what we think they might have looked like. It doesn’t matter if it’s, well, a bit wrong. In this new world nothing will be left to the imagination. In one instance the laughable Dulux job worked on Knossos by archaeologist Arthur Evans receives commendation. As a 20­year­old undergraduate I stood laughing in this famed Minoan palace: the painted murals, based on the faintest possible scattered fragments, were more Hollywood than belonging to the cradle of western civilisation. For me there was more truth in the few uneven shallow steps around the apron stage of a small outdoor theatre: 40 years on this contemplative place of escape remains vivid in my mind’s eye. As Knossos so plainly demonstrates, Mickey Mouse is not the answer. Disneyfication has already gone quite far enough. Museum shops, for example, used to be places where you could expect a decent stock of theme-related non­fiction. They now hawk fudge by the ton in the belief that the population is addicted to it. Museums seem no longer to want to educate us properly, prefering to fill our minds with the sentimental equivalent of, yes, fudge. Insulting our intelligence they assume that we prefer entertainment, some sort of untaxing ‘experience’ between expensive snacks. Potentially serious museum content is routinely reduced in thematic museums to buttery sentiment dished up for those who enjoy easy listening, easy reading, easy everything. No effort required here, they announce: we’ve done your thinking for you, so hurry along. Everything easy, so it can be easily forgotten. As in schools, subjects must be made digestible so that no one is made to feel thick, and if understanding can’t be made effortless then a flanking manoeuvre and ‘a form of words’ must be found to circumvent it. Effort has become the enemy of the state. Recently I visited two mines in Wales. Both are as visually eye-opening places as the most breathtaking natural phenomena. 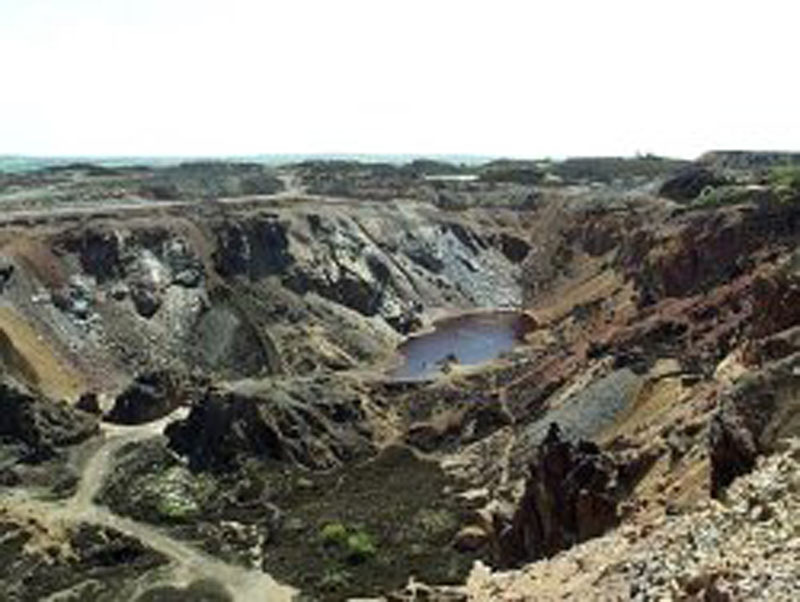 The first, Parys Mountain in Anglesey, overlooks the town and former port of Amlwch on the island’s north coast. It is manned by a single volunteer, a knowledgeable geologist and industrial archaeologist who works in what looks like a converted caravan at the edge of a makeshift car park. It costs nothing to enter but this extensive, fascinating site occupied a full afternoon with time flying. The second was a slate mine at Blaneau Ffestiniog in Snowdonia which had been Disneyfied to near death by those sticklers for historical truth – yes, Disney themselves. It cost the business end of forty quid for a family to enter and the ‘galleries’ were the mere prelude to a ‘Victorian’ street selling tat. At Parys the top of a Pre-Cambrian mountain was removed, like the top of a boiled egg, in search of copper and other valuable metals. Though there had been mining here since the Bronze Age, following Agricola’s subduing of the Ordovices in north west Wales in the mid-first century AD mining began in earnest. Alternate periods of desuetude and reworking over the intervening centuries, often caused by lucky speculative strikes, produced craters and spoil heaps rich in oxide colours and unique lichens acidic in hue. Visitors take themselves around the site aided by a map and an information leaflet in which each area and process in ore extraction is explained. When the Victorian mine was at its height the experience of workers, dangling perilously on ropes and climbing up a linked succession of high ladders burdened with sacks of rock, must have been indistinguishable to the modern mining photographs taken in Africa and South America by Sebastiao Salgado where similar conditions are still in operation. The horrifying casualties in Angola, Congo and Brazil must have been replicated here in Parys. Nothing is required here of visitors except their attention. We must stand and work it out, reconfigure it all forwards and backwards through time. It requires speculation to piece together and imagine the complicated symbiosis of work and life; the choking fumes of smelters and roasting kilns and the dangers of drift mining into unstable seams; the washing, filtering and precipitation of product, right down to the relatives of the miners who built clippers in local harbours to transport assorted quarries. No manikins or tableaux here illustrate the obvious fact that on this spot proletarian men and women were worked like animals to an early grave. The biggest crater, to the bottom of which you can scramble investigating and comparing veins and coloured ores, would hold two sports stadiums one above the other. Young people may roam, fossicking as they will for oddities. Beyond, at the farthest point in the production, there is the pretty view down to the sea at Amlwch. The town was built to lodge miners and armies of surface women labourers who broke up stones for a bob a day. Except for the numbing drunkenness, which required the building of a devoted brewery, the lives of these long-travelling searchers after a wage can’t have been worse than the hard-labouring prisoners of Dartmoor. There is at Parys any amount of time to reconstitute the life built around metal. Getting to the end of the process through wheelhouses, evaporation beds, blue-collar accommodation, beam engines and windmills, smelters and the foundations of scattered works buildings feels like an achievement. From a handful of rock hewn deep below to shining copper pipes in a Black Country engine house here was a microcosm of Victorian industrial economy based on enterprise, ingenuity and brave investment with all the incumbent dangers and exploitations. The mine was the centre of a diverse local economy. Copper was sent by boat to Liverpool and South Wales where, among other uses, it was cast into plates for copper-bottoming warships: HMS Victory had its timbers coated in copper mined here to prevent rotting and infestation of the wood; and the pools of metal-rich water on site at Parys were used for soaking ships timbers to the same end. By­products included industrial chemicals and a significant manufactory in the town for artists’ colours. All that is now left are the workings, deserted on most days. Please visit this remarkable place if you are about the vicinity. The “international award-winning” mine at Ffestiniog is at the centre of the slate industry upon which the whole of Snowdonia once thrived. It is part open cast and part subterranean in sixteen sloping seams. Mining is evident on almost every road through this damp upland whose cold appearance owes more to man than Nature. 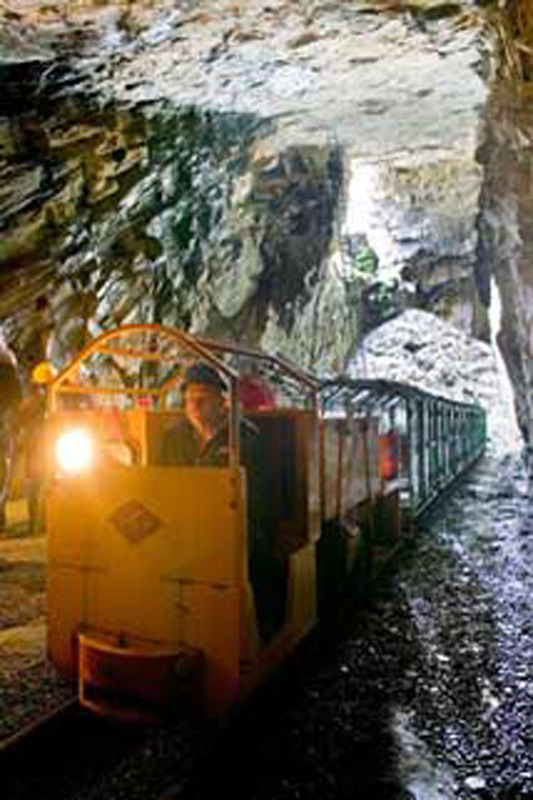 The region is criss­crossed with narrow-gauge railways first built to transport the sheets of slate to new ports north and south. Cavernous open cast workings, so treacherous for the thousands of labourers carrying heavy weights up and down a Hell of ever-deeper and ­narrower terraces, were sites of special interest for tourists even in the 19th century. Most are now overgrown and unvisitable except to the intrepid armed with an OS map and those prepared to ignore melodramatic warning signs. The industrial revolution was roofed and sometimes floored with Snowdonia slate while those lucky enough to be at school learned numbers and letters by chalking on the lower grades, though what precisely constitutes a lesser grade of material you won’t be told here. The better-off were frequently buried under or in front of a slate slab. The Llechwedd slate caverns are at their worst a satire on maudlin Welshness; a harpist, the local MP’s wife no less, twangs you through the gloom. Whilst being instructed with little beyond the obvious, groups are marshalled around deep workings with time controlled to the second, and then the lights go out. The son et lumiere cost £130,000, we are proudly informed, and involves “the latest silicon chip technology”. How very reassuring. Nothing is allowed to impede the relentless, hard-hatted progress to the stack of fudge at the door. No time is given to dwell, to be alone with speculations. The truth is I learned next to nothing about slate mining, excepting the basics of its cutting, but little of the larger industry of which it formed part. The only booklet for sale in the shop was useless, years out of date, and a more expensive book helpfully described slate’s rail distribution but didn’t address the subject as a whole. Everything uttered by the living guides and the taped Welsh ‘characters’ seemed aimed at a backward toddler. We were asked at one point to observe a minute’s silence to think about those teams who toiled long hours for a pittance entombed in the cold dark boyo. At the instant when the inevitable male voice choir intruded over the tannoy nuking Cardiff suddenly seemed a viable option. We weren’t told how many workers had been killed, or about life expectancy, or the many uses to which their product was put. Nor were we told why when they were building the visitor centre at the summit of Snowdon it was cheaper to fetch slate from China than to walk it around the corner on a cart. The very worst thing that can happen to any museum is the assistance of Disney. As a threat to truth and knowledge, and as rationers of serious information, these people and their infantilism should be prevented from entering the country. Whether it is education, museums or the BBC, we should cease being such passive and willing consumers of fudge. How State Art brought the good news to Essex. Yet another contemporary art gallery has opened, this one in Colchester. Years late and eye-wateringly over budget, it is another organisational triumph for an Arts Council which couldn’t deal drugs in Brixton. Designed by Raphael Vinoly it is finished in thin metal sheeting, little thicker than oven foil, painted gold and with shoddy workmanship everywhere evident – it flexes like a beer can when you poke it. It has all the short-lived allure of an impulse buy. Inside is an overpriced café (may I recommend The George on the High Street, it’s cheaper and more comfy) and a shop which doesn’t yet sell fudge but does, helpfully, sell reflective socks for bike riders. The building’s walls are curved, lean inwards, outwards – indeed, in every direction except perpendicular – which makes it unsuitable for showing paintings, a medium which those in charge hereabouts apparently consider “fuddy-duddy”. Acres of wasted wall space and wide corridors meet the visitor so he can wander while admiring white rendering and a winning view of the bus station. After so much trouble how could they have ended up with a place so obviously exclusive and limiting to future options? The opening show comprising otherwise unrelated stuff dragged together under the rubric ‘Camulodunum’, the Roman name for the fortress, capital and then colony, is feeble and includes not a single painting. This omission will be passed off by those in charge as a bold statement of their State Art credentials and not, of course, of the more obvious truth that State Art and its gauleiters are, for the most part, narrow-minded dullards who do as they are told. The exhibition is said to be about re­interpreting the past; Grayson Perry, Ai Weiwei (yes, the fashionable fat martyr himself), Sarah Lucas, Smithson, Warhol … It’s a real yawner. Two evenings work at the most to organise. Why go to so much trouble for something so negligible, so very predictable? This golden shed is a monument to a national artistic dictatorship which is incurably hubristic and perennially unwilling to meet people half way. It is a shining example of how to waste £26 million promoting the fads of a few. I made a mistake in the last editorial where it was stated that the Royal Academy school charges fees. It doesn’t. I am relieved to hear, therefore, that students are paying precisely what tuition from Professor of Painting Gary Hume is worth. November/December 2011 is the 100th issue of The Jackdaw. I considered commemorating this momentous numerical milestone but nothing immediately suggesting itself was either cheap enough or worth the effort. I’ll try harder for the thousandth.